The six lessons in the latest release for the Community Life series will help your small group members (and leaders) learn their spiritual gifts and begin to use them in safe environment. Using a unique method to discover one's spiritual gifts, this inexpensive resource guides the participants into a biblically-based understanding that spiritual gifts are for building up the body and increasing the kingdom of God.Through the weeks of this guide, the resource shows that spiritual gifts are where God uses one powerfully, not where he or she is comfortable... which is far different from taking a personal gifts inventory to see where one might want to serve God. The members of the group are invited to distribute a form to other believers who know them well to receive input on where they seem the person powerfully used by God. This process itself is transformational for everyone involved, not just the person using the material Spiritual Gifts this agenda book explores are as follows: Pastor, Leader, Encourager, Evangelist, Teacher, Wisdom, Prophet, Faith, Knowledge, Helps, Administration, Service, Mercy, Giving, and Discerning true and false spirits.Only the leader of each group needs this book, so it's an inexpensive way for everyone in your groups to learn about, embrace, and begin to use their spiritual gifts with power. 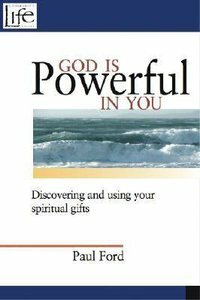 About "God is Powerful in You"
Paul Ford is an editor at "Harpers Magazine" and regular commentator on "All Things Considered,"